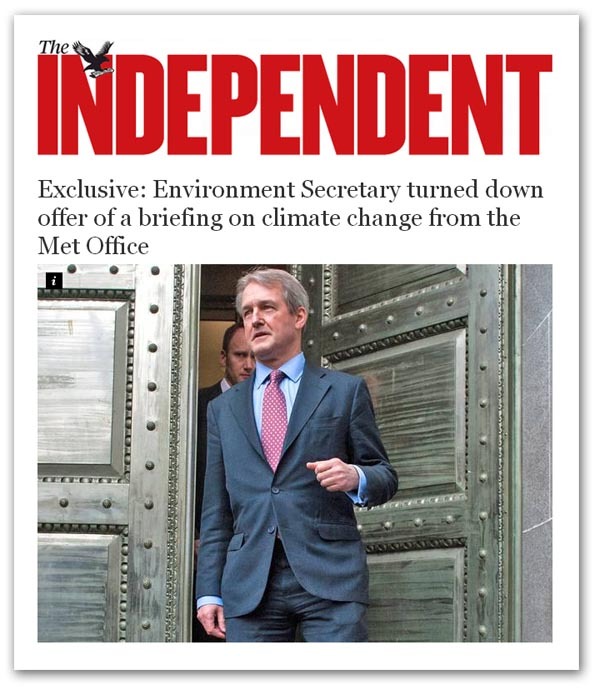 Without even beginning to understand why it should be so wrong, the Independent is waxing indignant about Owen Paterson turning down "the offer" of a briefing on climate change from Julia Slingo, the Met Office's chief scientist. The paper then goes on to describe the circumstances of this rejection, which arose in "the run up to a series of landmark reports from the United Nations". This was on 24 September – days before the release of the first report from what the paper describes as the "UN International Panel on Climate Change". Before we go any further, two points emerge. Firstly, the IPPC is not a UN body. Although jointly sponsored by UNEP and the WMO, it is an intergovernmental body. And that brings in the second point. Its title is the Intergovernmental Panel on Climate Change. These are not small points – they betray a mindset amongst the climate faithful, who place the IPCC in the dominant position, the superior body over and above subordinate nations, rather than the other way round, with the IPCC a subordinate body charged with providing briefings to the governments which own it. But with that mindset in place, it is only natural that newspapers such as the Independent should then regard the "scientific" acolytes to the IPCC as superior to a mere Secretary of State of the Environment, a lowly official of a "subordinate" national government. Thus, when a high official such as "professor" Slingo should deign to "offer" her services to the lowly Paterson, his only correct response would have been gratefully to accept her bestowal. That, instead, he refused, and then went on to make what critics called an "irresponsible and immoral" analysis of the IPCC report, was clearly beyond the pale. That Paterson went on to turn down the offer of a climate change briefing from Professor David MacKay, the chief scientific officer at the Department of Energy and Climate Change, is evidently seen as rank insubordination, defying his masters and failing to accord them the "respect" that their prestigious positions demand. That a mere Secretary of State could, in any manner, select his own briefings, from those sources which he trusted and which were less time consuming, is not something that our global masters could countenance. A lowly official such as Paterson cannot be allowed free rein to make up his own mind. It is a question of him being required to take his information from the "correct" sources. But the fact that he did not, and that his insubordination has been reported by the Independent, is another part of the story. With the story being revealed by way of a Freedom of Information (FoI) request, this itself reveals a deadly battle being played out at the heart of government. Highly placed entryists, within the various ministries, are charged with observing the behaviour of disobedient and free-thinking ministers, and reporting their deviations to a tightly-knit group of full-time activists employed by big-name NGOs, mostly in the animal welfare and environmental camps, where there is seamless planning and coordination. The insiders, thus tip their handlers as to what FoI questions should be asked, which are then farmed out to anonymous proxies – who launch a volley of Exocets at the heart of government, the intention being to destabilise and weaken dissident ministers, and keep them in check. It is no accident, therefore, that Owen Paterson has been the object of a torrent of hostile briefings, many finding their way into the likes of the Guardian, the Independent and the BBC. This is part of a sustained, NGO-driven initiative, coordinated at the very highest levels of our emerging global governance, with Brussels-funded organisations in the driving seat. There is thus more than an interesting contrast in what finds its way into the media and what doesn't. The revelation that public money is flooding into a private US charity, to "design the 2015 global climate change agreement" gets scarcely a mention, while the behaviour of a "disobedient servant" gets full-frontal treatment. And that is no accident. Our NGO masters are setting the agenda.